Queen Charlotte is a large, detached Georgian style residence with stunning high windows and ornate featured ceilings. On the semi-rural edge to the west of Weymouth,Dorset area in UK, the home is ideally located, just moments away from the coast. Queen Charlotte Nursing care home provide excellent care for elderly senior residents in Weymouth and Dorset region. Queen Charlotte is a large, detached Georgian style residence with stunning high windows and ornate featured ceilings. On the semi-rural edge to the west of Weymouth, the home is ideally located, just moments away from the coast. Explore the services provided at Queen Charlotte which are designed to make each and every resident’s stay a pleasant one. "To all at Queen Charlotte - Gilliam and I would like to thank you all for a lovely attention we spent with you all on the occasion to mark The Queens Birthday and National Care Home Day, with the wonderful atmosphere and entertainment to us pleased to see what caring staff you have at Queen Charlotte. Thank you for the lovely flowers and the signed carers, we really enjoyed our stay"
"To all the staff at Queen Charlotte - There are too many fantastic staff nurses, carers, and all the supporting staff to mention in person. So sincere thanks to you all for the wonderful care and attention given to Terry, our husband and Dad, over the last nine weeks. We will always be so greatful to you all." "'Snow Report' - Having been here to witness it I wish to congratulate Debbie and the whole team who all went to great lengths to get here and provide the full 24 Hour Care to patients as normal, with willingness to cover 'shifts' at short notice, arraning lifts for others, slipping over trying to get to lifts, walking several miles on ice covered pavements, having to push cars getting stuck in snow and some still getting here by 7a.m. with smiles on their faces, all goes to show the 'Real Team' spirit that does exists here." "I am writing to you to inform you of the wonderful care my late mother received at the Queen Charlotte nursing home. My mother had had a history of strokes, with some mild dementia. My mother came into Queen Charlotte, just over three months ago, until she died on 30th September 2017." "You are the "A" team, "The Best" and I so hope you are so proud of your amazing abilities in care, support of families, your warmth, your devotion to your patients, and your togtherness." "Queen charlotte care homes in Weymouth,Dorset. Award winning nursing homes near weymouth.Book a visit to queen charltote care homes weymouth,dorset." "Staff know where she is and what she needs","Never had concerns about safety. Carers are nice and caring". “People and their families told us the food was good,Top notch'”. “We observed staff showing people patience and kindness. One care worker said "We all have a lot of love in us. We all care". Another told us "I love working here with these residents, they are all very special people, all different and I have a great respect for them all". When people were sitting awkwardly we observed staff helping them get comfortable.”. “One family told us a birthday party had been organised by the home for their relative. They said "Staff pulled out all the stops and the family really appreciated that". We observed staff showing an interest in people as individuals and asked their opinions about events in the news and other topical issues. Staff were quick to respond to people's requests and the relationship between staff and people was affectionate but professional.”. “One member of staff told us 'This is the resident's home, it is not our place of work, we just come here to support people who live here just as much as if we were community carers going into their homes. We treat this as their home because it is, so we have to ask their permission to go into their rooms and every carer does'. Another member of staff said 'I love working here with these residents, they are all very special people, all different and I have great respect for them all. This is a wonderful place to work with a great team'”. “We observed people enjoying activities with staff such as knitting and talking about pictures in books of topics they enjoyed. Staff had a good knowledge of peoples interests and engaged them in conversations about their past jobs and hobbies. We were told of one person who enjoyed people watching and arrangements had been made to go into the local town for a coffee". Our ‘person-centred’ approach means that each and every one of our residents is treated as an individual and given love, attention and a unique programme of care according to their needs. Our magnificent home, set in stunning grounds, is always open to visitors and our dedicated and professional staff are always on hand to help and advise – visitors are as welcome here as they were when the resident lived in their own house, at whatever time of the day. At Queen Charlotte you will find spacious, comfortable bedrooms, all with en suites, decorated with style and furnished to a high standard. There is a range of friendly, spacious lounges where you can watch TV, chat to friends, listen to music or just enjoy peace and tranquillity and gorgeous grounds. Take a look at the 360° tour to find out all about your new potential home. Each and every one of our Kingsley care homes is unique in its own way. However at each of our care homes we all have a common set of highly respected and award-winning features embedded within the culture, and the way we care for our residents makes a remarkable difference. Our daily emphasis is on the care that our residents need, whether that be physical, emotional or mental health. Residents who are experiencing memory loss benefit from arguably the most enlightened approach to dementia care that exists in the UK at the present time: our truly person-centred approach. Our organisation, Kingsley Healthcare, recently invested into Dementia Care Matters, a world renowned consultancy group in the dementia care field, who aid us in excelling at providing quality dementia care. We are one of five homes within the Kingsley group currently chosen to work towards the prestigious status of ‘Butterfly Service’. More than just simply providing dementia training, this approach is about a change in philosophy, which creates a positive culture and focuses on the quality of life and relationships. It’s best summed up by the saying, ‘Our residents don’t live in our facility – we work in their home’. 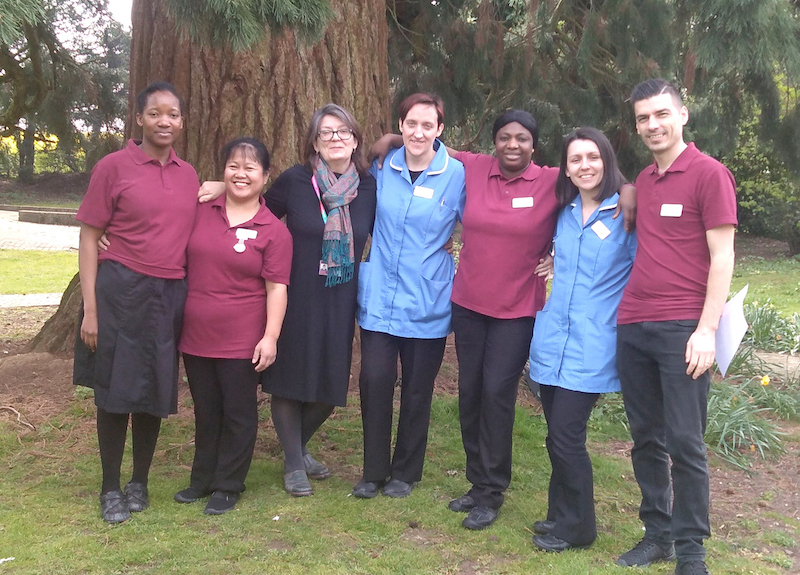 We develop programmes of assistance and care that suit the needs and wishes of each resident as an individual, and our approach to care is, we believe, second to none. At Queen Charlotte you’ll find a packed schedule of optional activities. Our goal is for all our residents to feel relaxed and happy, so you’ll never be forced into taking part, but we do like to encourage people if the activity or entertainment will benefit you. We understand that everyone is unique, which is why we assess each resident individually and organise activities around them, allowing them to choose whether to join in or not. We learn all about our residents’ life stories, tastes, interests and hobbies. Once we know all about our residents, we can think of ways in which to get them interested and involved. Our person-centred care is focused around each person’s individual needs and wishes, and we value and respect how each person chooses to spend their day. We not only aim to meet individuals’ physical needs but their emotional and spiritual needs too. We also support our residents in maintaining their independence as much as possible, thus embrace and encourage ways in which they can achieve this. We want all our residents to live as healthily as possible, to aid long and pleasant lives. We encourage exercise, keeping minds active and eating nutritious food. Our healthy, balanced meals are made from scratch in our kitchen using only the best, locally sourced ingredients. We also realise that eating habits vary, and our cook is able to provide a varied diet to meet everyone’s needs. The menu is regularly updated with suggestions by residents, to keep meal times interesting. Meals are at set times but you can opt to eat these in your room if you wish, and your family are able to join you whenever you like. Snacks and drinks are available throughout the day, and alcohol is available in the evenings. You can get up whenever you like, and go to bed whenever you like too. If you’d like breakfast in bed this can be arranged. And remember your family can visit at any time. The people, environment and embedded Kingsley culture all go towards creating a family feeling at Queen Charlotte. Staff eat with the residents and even work with individuals who enjoy helping out around the home. We ensure that the dining area is a communal family experience with everyone interacting, which creates a positive atmosphere throughout the home. Staff are trained and skilled in involving individuals in the numerous activities available, and become like family to the residents. Reputed to have been the residence of Queen Charlotte, the wife of King George III, Queen Charlotte is a beautiful detached Georgian style house with large windows and ornate featured ceilings. Set in well-maintained grounds, it is to the west of Weymouth, very near the coast. The home has a large amount of different communal areas, all decorated and furnished to a high standard, and as such makes an ideal home for our residents. The home serves a wide area within Dorset including Weymouth, Dorchester, Crossways and the Winterbournes. We actively encourage those who are considering living at Queen Charlotte to visit and spend some time at the home to gain an accurate perception of the care we offer. It will give you an opportunity to meet the team and ask any questions you may have. Please feel free to look around at any time that is convenient to you. Staff are around at all times of the day and they will be happy to give you a guided tour of the premises and answer your questions. Queen Charlotte’s staff are trained in the ‘Wings’ dementia approach, are caring and empathetic and work with a professional attitude. The home has addressed the issues highlighted in the report and after re-inspection by CQC is fully compliant with standards.